This episode comes only 6 episodes after the The End of the Beginning, suggesting the middle was pretty short. A new employee is shown around Cybertek, an expanding business with a mysterious "incentives programme" that no one says no to. The handlers watch as super soldiers approach the Shield team. 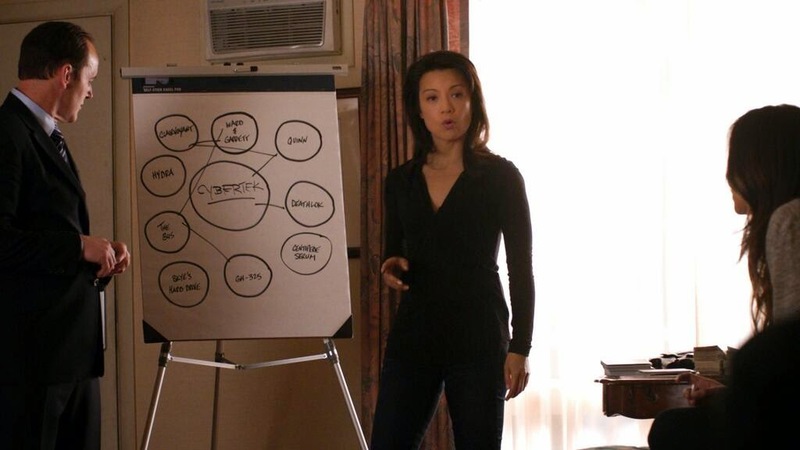 Skye activates her trojan horse in Cybertek's systems, while Trip, Coulson and May take on the soldiers. May takes the Asgardian berserker staff from one and uses it to defeat them. Garrett's revival has left him manic, scratching odd patterns on glass and making no sense to anyone besides Raina. He and Raina discuss evolution and the future, she tells Garrett and Ward that Skye is special and will be part of what is coming. 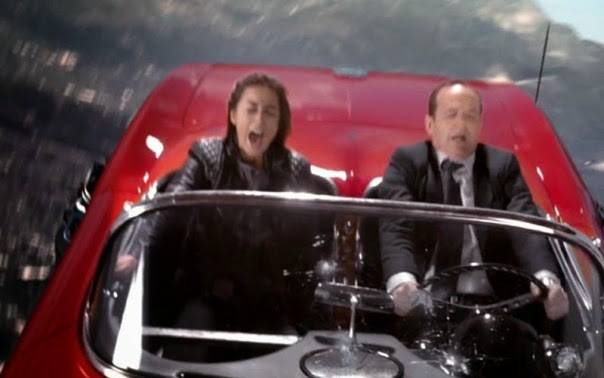 Fitz and Simmons are trapped in a container at the bottom of the ocean. Fitz realises that they can't escape and reluctantly tells Simmons when she regains consciousness. With the info from Skye's hack the team breaks into Cybertek; Trip and Coulson steal a vehicle outside and blast a hole for Skye and May to get inside. 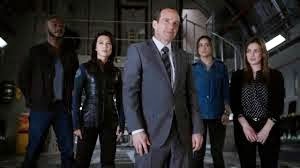 Skye finds the handlers, says she has a bomb, and all the super soldiers are sent to protect Garrett, leading Coulson straight to him. Quinn is showing military types around, trying to sell the super-soldiers, Garrett arrives, says a lot of weird stuff then brutally kills a general. 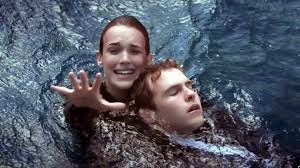 Fitz and Simmons talk about death then Simmons figures out a way to escape, but Fitz reveals that there's only enough oxygen for one of them. Fitz gets Simmons to take the oxygen and she pulls him to the surface. They are unexpectedly rescued by Nick Fury. Ward confronts Skye, but May attacks him and the pair have a brutal fight. Skye forces the senior handler to take her to the "incentives programme", which is people's loved ones being held in cells to ensure their good behaviour. Coulson confronts Garrett, surprised by his weird talk and super strength, then Fury turns up and joins the confrontation. Skye rescues the incentives and finds Ace, sending a message to Deathlok, who she's been in contact with. With Ace safe Deathlok attacks Garrett. Cybertek is taken down, the soldiers are freed and the tech is seized. 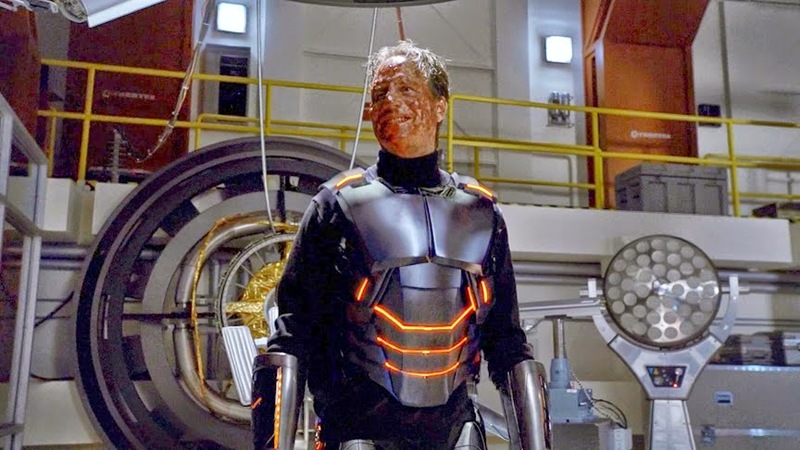 Garrett revives and is upgraded by the cyborg machine, but Coulson kills him with the Peruvan 0-8-4. Coulson confronts Fury about what he put him through, Fury concedes the point then charges Coulson with rebuilding Shield as the new Director. The team go to a new secret base where another Koenig welcomes them. Raina visits a shadowy former associate, who is Skye's father. 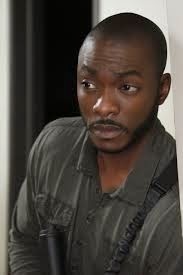 Coulson wakes in the night, sees the scratched pattern Garrett made and does the same thing on the wall. Plans breaking into Cybertek, briefs the team in code, which foreshadows what they actually do. He confronts Garrett, unaware that he now has super strength and a weird, pseudo-mystical view of the world. When facing Garrett Coulson and Fury are in synch, angry at his selfish betrayal and confused by his new mania. When Garrett revives and upgrades Coulson kills him without any remorse or concern. Coulson finally gets the chance to confront Fury about resurrecting him and putting him through something that Coulson himself advised against. Fury concedes Coulson's right to his anger, but explains how important Coulson is to him, and to Shield. He makes clear that he counts Coulson as an Avenger and that all the core principles of Shield are embodied within Coulson. Coulson is surprised when Fury tells him to rebuild Shield, but it's been his life so of course that's what he's doing next. Old Shield was big and unwieldy and had bad stuff hidden in its many shadows, but now it can be recreated carefully with good people at its core. During the fight in the basement May gets hold of the Asgardian staff, proving the despite being super these soldiers could be better trained. Later she fights Ward, unleashing all the rage she told Skye about last episode. It is brutal, going into a construction area with both using power tools against each other and throwing each other through plasterboard walls. May eventually nails Ward's feet to the floor and roundhouse kicks him a few times. 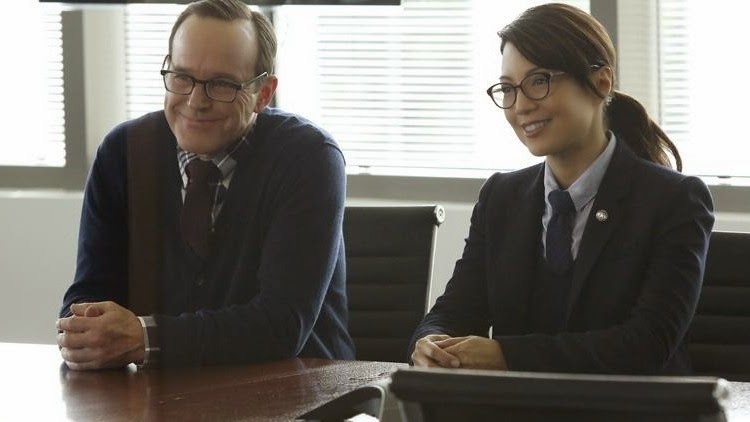 While Coulson is trusted to rebuild Shield Fury trusts May trusted to have Coulson's back. Ward is worried about Garrett's state of mind, he's still loyal to Garrett and is looking for orders or some indication of what's next now that they've achieved what they've been planning for so long. When Garrett suggests Ward can have/do what he wants Ward doesn't seem to understand, he's too used to being a foot soldier. Garrett's weird rambling about the universe makes Ward impatient and he gets angry with Raina for encouraging it. When Garrett rips out part of a general Ward has to lock up the other officials. Ward is sent to deal with Skye, and says some really creepy stuff to her. He tries to taunt May as they fight, it doesn't work. 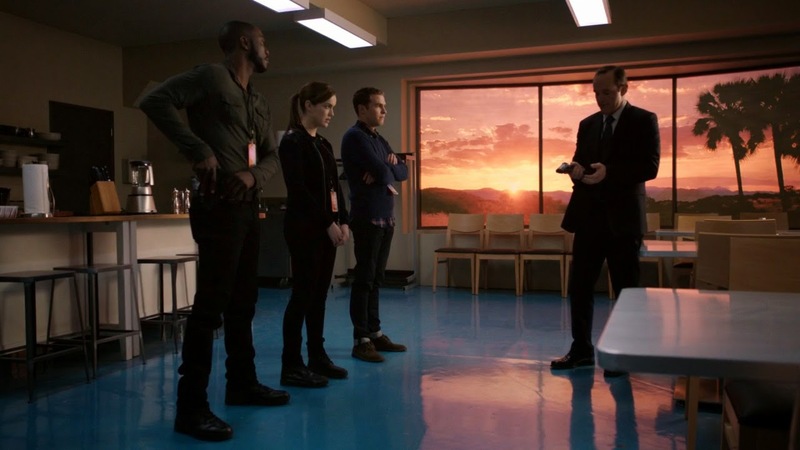 At the end he's captured and can't speak as May damaged his throat, Coulson tells him they're going to keep him locked up and he will have to figure out who he is without Garrett. Trapped on the sea floor Simmons regains consciousness to find that Fitz has figured things out. He's set his broken arm and created a weak distress signal, though given Sheild's collapse it's likely no one is listening. They can't escape the container, and even if they did they'd be stuck in the ocean. As they discuss their ideas about death Simmons realises they can escape the container using what they have, though then they'll be in the middle of sea. Fitz can only rig enough air for one and insists Simmons take it. She doesn't want to leave her best friend, and he shyly and reluctantly admits his feelings for her. She's distraught at the idea of leaving him, shows affection while crying, but never commenting on what he's said. The situation is so dire and given all that's happening she probably can't fully process what he's said. Fitz forces her hand by igniting the explosive while she's holding the oxygen tank. She grabs hold of him and drags him to the surface with her, even though it's unlikely to do him much good. 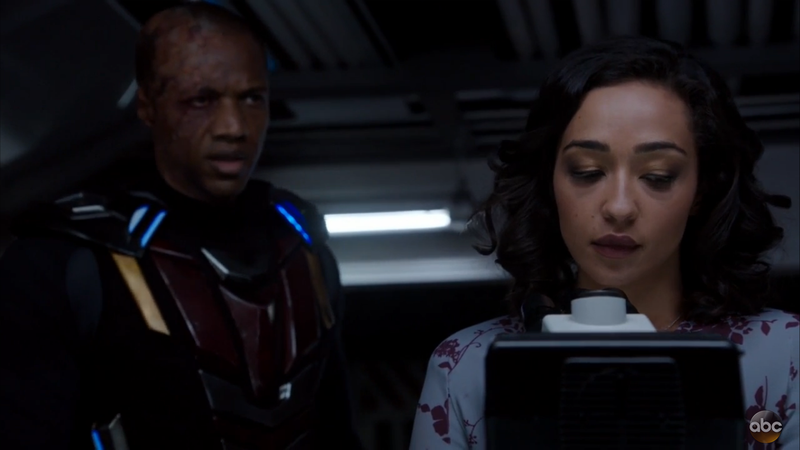 After Fury rescues them Simmons has to stay in a chamber, she probably has the bends, but she's still able to tell Fury how to track Coulson. This is more than Fitz can do, we don't see him again, but it's clear he's barely survived. As well as possibly having the bends he was likely close to drowning and the ascent won't have helped his broken arm. At the end SImons is reunited with the team at the new base, but it's sad that Fitz isn't there. Raina again talks to Ward about Skye and the whole vague back story that Skye knows nothing about. Raina suggests that Skye could be Ward's and that in some way they're both monsters. Whatever similarity Raina sees between herself and Skye it doesn't stop her from seeing Skye as a commodity. Skye activates her hack while there's fighting all around, and uses it to trace Cybertek and get into Deathlok's feed. Skye rescues the people held by Cybertek, removing their hold over a lot of their soldiers. She talks to Deathlok at the end, he's still reluctant to see Ace wanting to make amends for all the terrible things he did while he was being controlled. Skye is supposed to take him in, but she's more of a liberator and lets him go. As he points out, she has access to his feed and can track him if she wants. Trip scopes out vehicles with Coulson and his grandfather's spy gadgets are used to create a diversion. After Cybertek is infiltrated Trip is kind of sent away to make himself useful and is kinda absence until the last bit. Garrett and Raina look at the gravitonium, they both sense something about it and though it was promised to Quinn as payment it seems they have other plans for it. We never get told what those plans are though. While they're wrapping up Cybertek (with more people than you'd think fallen Shield would have) it's found that the super soldiers can be returned to normal, though they'll be missing an eye. a lot of one-eyed men about. Garrett's reaction to the recreated GH 325 makes him spout a load of weird pseudo mystical stuff, causing everyone but Raina to think he's gone insane. He also draws that writing which has appeared in the show before. He tries to claim kinship with Coulson as they both had the drug, but Coulson seems to have escape without the mania the he reported when suggesting project Tahiti closed down. Garrett was already a murderer but his new weirdness makes him more unnerving and brutal. Raina's interest has always been people with powers, though she as willing as anyone to use them. She's convinced she had untapped potential, as does Skye, and the thing she wanted to as ask the Clairvoyant is what she will become. Quinn just wants to make a lot of money and get his soldiers in important places. His sales pitch to the US military is very polished, until Garrett derails things by being first weird and then homocidal. Garrett (interrupting Quinn's pitch): You hear the dying breath of an old world, general, and a new world is coming. I taste it on my tongue. General (dubious): This is your strategy consultation? You don't have to call me sir, Coulson. I look like I live under a bridge. Garrett: You haven't seen the big picture, the big bang, the timeless frozen ocean, but Phil here has. We share a bond. We're blood brothers. Fury (to Coulson): You didn't tell me he'd gone this crazy. 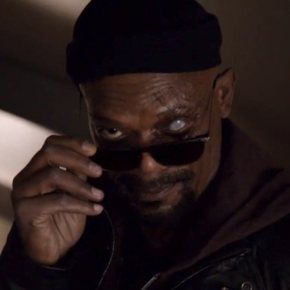 Coulson: He's really stepped it up a notch. Fury: A part. A part of something bigger. Garrett: Is that how it went? Skye reveals that the bomb she's been threatening the chief Cybertek handler with is actually Ace's Hulk toy. At the new base the team are surprised to meet Billy Koenig, identical to his brother Eric in looks, speech and mannerisms. "Lanyards will be handed out on a case-by-case basis." The patterns Garrett scratches into the glass seem to be better understood by him than Coulson, who starts scratching the onto the wall. This writing will be a major part of the first part of series 2, all part of the fall out of Project Tahiti. Ward does kinda figure out who he is without Garrett. Not sure what his plan is (if he has one) but he seems to revert to where Garrett found him 15 years earlier.